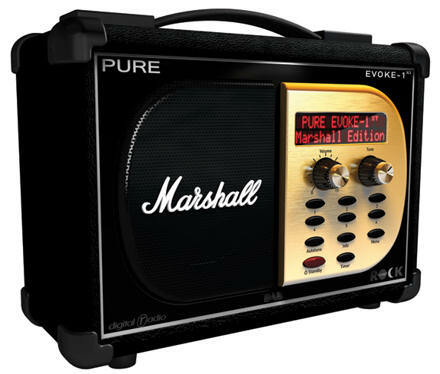 For Christmas the lovely Jane™ bought me the Pure Evoke-1XT Marshall DAB radio. How cool is she! 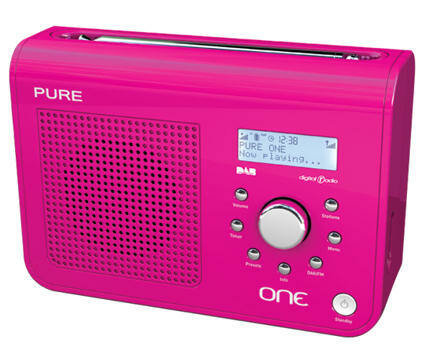 As many of you will know I also own a pink (Jane picked the colour) Pure One DAB radio. So I thought it would be quite fun to write up a comparison of the two. I’ve had this radio for over a year now, and I wouldn’t want to be without it. It’s simplicity itself to use. I’m actually glad we got the pink version as it looks more cool than the white, black or talkSport versions. More than half of the front is dedicated to the 3″ speaker, with the other ‘half’ hosting a 3-row LCD display and a large control knob surrounded by seven small buttons. The standby button switches the unit on and off. The rear of the One gives access to battery compartment which accepts 6 x C batteries or the optional (and expensive) ChargePAK rechargable battery. There is also a mains power socket on the rear. The right-hand side of the radio houses two ports: USB (for firmware updates) and a stereo 3.5mm headphone socket. It has a lovely rounded feel and is really easy to carry about the house, particularly if you’re using the ChargePAK or batteries. I mostly listen to BBC Radio 4 and Planet Rock on my DAB radio, and both sound great. The 3″ speaker gives a good full sound that doesn’t distort even at full volume. I don’t know how loud it gets (in dB) but it’s certainly loud enough. My only real criticism is that the volume has only 16 indexed positions, and when listening to the radio in bed at night 3 can sound too loud and 2 too quiet. A more fluid un-indexed volume control would have been better. The sleep timer is good, but an alarm feature would be equally as useful. Perhaps in a future update? All in all this is a great portable radio, with an impressive sound that you can take anywhere. The FM option is great for areas where there is no DAB coverage, or for use with your iPod’s iTrip FM transmitter. With the ChargePAK you can install it and forget about it – it charges automatically when you plug the radio into the mains. The ChargePAK gives about 20 hours of use. One annoying thing, that I’d love Pure to update in a firmware upgrade, is that the display backlight goes out too quickly. The options are timed, on or off, with no control over how long “timed” is. It’s about 7 seconds, which just isn’t long enough to read scrolling text. I’ve now had this radio for 12 days and I love it. Love it so much in fact that I’ve already bought the XT-1 Marshall Edition speaker extension giving it both stereo output and a richer, deeper bass experience. There is no doubt that the Evoke-1XT Marshall is the epitome of cool, drawing its design from the classic Marshall amps: black, white and gold with the legendary Marshall signature slapped across the custom-made 3″ speaker. The gold control panel is home to a two-row LCD display, two Marshall control knobs: Volume (it really does go up to 11) and Tune, and 11 other buttons (6 presets, Autotune, Info, Menu, Timer and the red Standby button). When you switch on the radio for the first time it automatically searches for stations and sets Preset 1 to Planet Rock, the UK’s leading digital rock station. There is a Planet Rock logo in the bottom right-hand corner of the radio. Round the back you’ll find the aerial, a USB connector for firmware updates, a stereo out socket (3.5mm), stereo headphone socket (3.5mm) and aux speaker socket (also 3.5mm). You’ll also find the power input here too (9V DC). It’s a Marshall – it sounds great! And with the XT-1 auxiliary speaker it sounds even better in stereo, and with a slightly punchier bass. The volume knob goes up to 11 (“but why not just make 10 louder? !”) and even at that trouser-flapping level it still sounds pretty clear (if not pretty!). The volume control is smooth, none of the indexed-nonsense of the One. You can set the volume exactly where you want it. In many ways the Evoke-1XT Marshall has fewer features than the One. The power supply is mains-only, with no option to run it off batteries or a ChargePAK. It can store only 6 stations rather than 20 (but then how many stations do you actually listen to regularly? ), and doesn’t support FM (so put your iTrips away folks), and the red LCD display shows less information at once than the One. While there is no sleep timer (a serious omission in my book) there is a kitchen timer (for those metalheads getting their rock cakes out of the oven, no doubt) and a proper alarm so that you can wake up to the pounding sounds of Planet Rock in the morning. The Evoke-1XT Marshall isn’t as versatile as the One, but then it’s not designed to be. It’s a rocker’s radio, plain and simple, and as such it does its job very, very well. Having to choose between these two is like having to choose your favourite child! They’re both great, but both very different. I love the versatility and portability of the One. It just comes along with me, no questions asked. But the Evoke 1-XT Marshall just looks and sounds so cool. Each have features that I’d like to share with the other. But in my opinion, what would make both radios much more attractive is the ability to record from the radio to your PC via the USB port. That would be excellent. Here’s our annual Christmas newsletter for those of you who didn’t get a paper copy through the post. Having moved into our new home in November, we were feeling quite settled by New Year, which we celebrated in style with Eddie, Rebecca and Owen. Of course, when we say “style” what we really mean is that Eddie and Gareth played Lego Star Wars on the PC in the study while Jane and Rebecca sat in the living room chatting and drinking champagne. About a week later lardy Gareth realised his New Year’s ambition (of the last eight New Years) to get on his bike (and drink his milk) and begin to get fit again. It’s been a long, and at times literally uphill struggle, but his efforts are paying off, the fat is dropping off and so are his clothes! Having enjoyed so much our experiences of moving house three times last year we helped Gareth’s Mum Rosalie move from her family home of 35 years to a newly-built flat about half a mile from there. Between March and August we travelled down to Selkirk most weekends and got to work clearing out, packing up and redecorating the house ready to put it on the market. It was exhausting and emotional work, that reawakened many a memory, both joyful and sad, but looking on the bright side we did get to be on first-name terms with the man at the dump! His name was Stig. Rosalie moved out of Kirkbank Cottage on Wednesday 22 August, and into her newly-built flat about half a mile away. Unfortunately the carpets weren’t all laid, the gas pipe had only just been installed (that morning) and when we arrived with the keys the floor was up! It was certainly an adventure! But Mum was soon settled in. By ‘soon’ I mean after about four months. For the first few months it literally looking like a building site outside her front door, her telephone wasn’t connected for three months (thanks BT! ), her shower didn’t work for just as long, and her garden needed landscaped before she could plant anything. Bit by bit she’s getting there, though, and we get down to Selkirk as often as we can to lend a hand and give her a hug. Not to feel left out Jane’s parents, Peter and Dorothy, also moved house, from Edinburgh to Anstruther, where they’ve bought a house with plans to open a Christian retreat house. Unfortunately their move went fairly smoothly and there isn’t really any drama to report. Their new house has a pond, and the original Anstruther village well under a man-hole cover in the drive. There’s a palm tree in the garden too. And a fridge in the kitchen. I told you there wasn’t much drama! In May Gareth’s hard work coding the new website for the University of St Andrews paid off and the site was launched to the public (and the rest of the University). You can visit it at www.st-andrews.ac.uk (but don’t use an old browser!) We went live slightly earlier than we’d have hoped and spent the next fortnight answering support calls from a safe position beneath our desks! When it was safe to come out we were able to realise what an achievement it had been to move around 4,000 pages from 35 websites into one, all-singing, all-dancing, shiny new website in about 10 weeks. Seven months on and we’re still fixing things. It’s very much like moving house, initially dumping our content in different ‘rooms’ and sorting it out later. In July we travelled down to Hereford to support our friend Jonathan Coore who was ordained deacon, stopping off en route to visit friends Kenny and Chris Fyfe in Newcastle-upon-Tyne. A quick overnight visit in Bristol, via Wales, and then it was back up the great British motorway network of the UK (via Selkirk) to sunny Anstruther. All in three days. We know how to relax! Jane enjoyed our long, hot and dry (?!) summer weekends playing tennis at the Anstruther Tennis Club, where she was voted player of the year with most potential. Gareth, meanwhile, was still cycling the back-roads of the East Neuk of Fife trying to lose weight and bring his blood pressure down. In July we bobbed to the top of the waiting list, and got a bit of a fright when they called us into the hospital about three or four months sooner than we had anticipated. But we needn’t have worried, because it still hasn’t begun! Due to unforeseen complications Jane’s three months of preparatory (and painful) injections turned into four months, and then five. Which then led to an operation and the whole of December off to recover. We expect to begin (again) in the New Year (2008)sometime. We continue to hope and pray. After four interesting years with The Duke of Edinburgh’s Award Jane couldn’t take the extensive, all-over-Scotland travelling anymore and moved to a ‘closer’ job, starting in August . in Kirkcaldy, which is 35 miles closer to Anstruther than Edinburgh. Jane’s new role is as Service Manager at Aberlour Victoria Family Centre; that means that she’s the boss. (Isn’t she just!) The Victoria Family Centre offers parenting advice and respite crÅ che facilities for some of the most vulnerable families in Kirkcaldy. One of her aims is to raise the profile of the centre within Aberlour, which she managed to do very effectively on her second visit to head office in Stirling when she launched herself down the stairs, ending up in A&E! She and her project are now very well-known. Well done Jane! In August we spent a couple of nights in a lovely B&B at Alturlie, overlooking the Moray Firth (we still didn’t see any dolphins), and caught up with lots of old friends from the cathedral. One highlight was phoning up the Frasers to see if they were available for afternoon coffee and being invited to supper. Which was super. What wonderful hospitality we experienced in the Highlands. Another highlight was catching up with Des, who was the Church Officer at the cathedral during our time there, and really helped to keep Gareth sane. 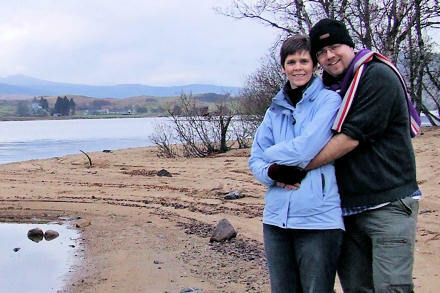 We returned to Inverness in October, staying with the Howies in Beauly (what a memorable curry! ), to attend our second ordination of the year, that of The Revd Canon Mark Strange who was ordained Bishop of the United Diocese of Moray, Ross and Caithness. What a celebration! What a sermon! (See http://tinyurl.com/yww732 for the sermon script.) What an awful lot of young people in the cathedral! It was a real joy to be a part of that significant event. The best service we’ve ever attended in the cathedral. As we were processing in, to a rousing trumpet and drums fanfare, I spotted my dear friend Jamieson Sutherland in the pews. As I passed by I leaned over and said quietly “Hello gorgeous!”. At least, it would have been quietly had the trumpet fanfare not just silenced completely. I winked at him on the way back up the aisle at the end of the service. And not a subtle wink either. It made us both laugh. Laughter is good in church. Even at funerals, so Fr David reminded us in his sermon. On Gareth’s birthday (11 November for future reference) we joined Gareth’s brother Eddie and his wife Rebecca in Edinburgh to see the popular beat combo Deacon Blue playing their instruments and singing for the enjoyment of the public in a live concert held at the Edinburgh Playhouse theatrical emporium at the top of Leith Walk in Scotland’s fair capital city (Edinburgh). The gig was really for Jane and Rebecca, who as massive Deacon Blue fans. Eddie knew most of the songs because his is a walking pop music encyclopaedia. Gareth knew about five songs, and actually preferred the support act, 6 Day Riot, but don’t tell Jane. After the excitement of watching Ricky Ross & Co. November was obviously a quiet month, because all we can think to report was that on 12 November, exactly one year and one day after we moved into our new house, we realised that we still didn’t have any lampshades. So here’s a top tip for you all: don’t go buying all your lampshades in one go. It’s really rather expensive. “Why did we buy them all in one go?” asked Jane. “Because I was on a mission!” said Gareth. Other highlights of the year include Gareth seeing thrash legends Kreator and Celtic Frost in concert in Glasgow; continuing to play guitar at the Christian youth event Powerpoint Edinburgh run by Scripture Union Scotland (see http://powerpointedinburgh.wordpress.com); Jane’s sister Pauline had a son, Aidan; Gareth has continued leading church services at Newport-on-Tay, Leven and St Salvator’s Chapel, University of St Andrews. Finally love and thanks to all our friends and family who came to stay during the year. We look forward to welcoming you here during 2008.